OCTA assumed ownership of the 91 Express Lanes 15 years ago to eliminate barriers to improvement along the SR-91 corridor. Every day, we continue our mission to offer a transportation alternative that provides a seamless commute to allow you to enjoy life on time. Safe: If you need help, the customer service patrol will be quickly dispatched to provide towing, tire changes and other free services. Reliable: Avoid traffic and spend more time doing what you love. The 91 Express Lanes gets you there sooner. Smooth: Travel with confidence over the well-maintained surface of the 91 Express Lanes. 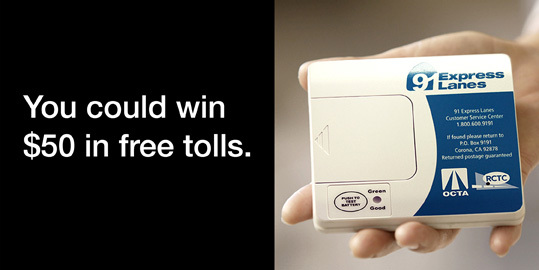 Open an account and you’ll be automatically entered to win $50 in free tolls. One $50 credit will be awarded every week. Sign up today and start traveling faster! Celebrating the milestones behind the seamless commute enjoyed by millions. In 22 years on the job, I have been an outstanding employee who is never late, thanks to the 91 Express Lanes. On the day my 25th wedding anniversary cruise departed from San Pedro, our truck had a dead battery and we were running late. We got to the port in time because we drove past the traffic. We kept telling ourselves how lucky we were to not be sitting in it. Thank you, 91 Express Lanes! The 91 Express Lanes allows us to choose the best lifestyle for our family. We live in Chino Hills and our children attend school in Anaheim. Thanks to the 91 Express Lanes, the drive takes only 30 minutes. In the afternoon, we get home in time for soccer and taekwondo practice. We love the 91 Express Lanes and the comfort it provides our family! The 91 Express Lanes totally changed my life. It helped me get there in plenty of time to relax before my interview with the Special Olympics. Getting the job was a dream come true! The 91 Express Lanes is totally worth your investment because you never know what's waiting for you. Since 1995, five of my six beautiful children have been born in Corona or Orange. Every time I received the "It's time to go to the hospital" calls that necessitated leaving work, the 91 Express lanes allowed me to get home in time for the birth of my children. Thank you, 91 Express Lanes! Beginning on March 20th, 2017, you’ll be able to drive farther on the reliable, safe and smooth 91 Express Lanes thanks to an 8-mile extension into Riverside.